As Bulls players and coaches know, a commitment to the game of basketball is required in order to win at a high level. It involves hard work, focus, dedication, and doing what it takes to be prepared. 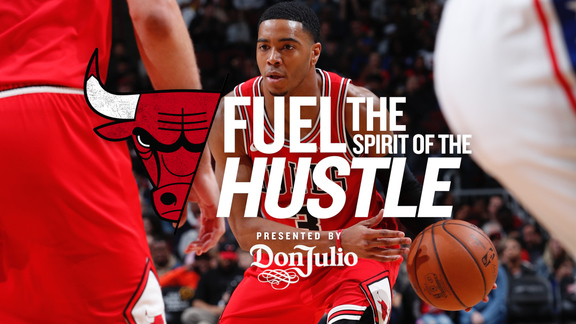 Those same elements apply to the organization’s pledge to give back to its community, which was precisely the theme on Thursday when the team hosted “An Evening with the Chicago Bulls”, its 26th annual charity gala. Presented by BMO Harris Bank, the event was emceed by Val Warner and Ryan Chiaverini from ABC 7’s Windy City LIVE! and featured a performance by comedian Gary Owen. For the first time, it was held at the Advocate Center, the team’s new practice facility across the street from the United Center. Joakim Noah, who in the last year has worked with the Bulls to host his One City Basketball Tournament and various initiatives for his Noah's Arc Foundation, agreed that to make an impact off the court as well as on it is a matter of putting in the work. Along with Michael Reinsdorf, president and COO for the Bulls, Noah, his teammates, coaches, ambassadors and broadcasters were on hand for a progressive cocktail reception, dinner, live entertainment and a silent auction. One of the highlights of the event was a BullsTV-produced video featuring the team’s Community Relations interns: Alan Batrez, Lavell Gamble, Sherdell Mallett and Monica Ocampo. The interns came to the Bulls through the team’s partnership with Urban Alliance, an organization that works with companies to provide under-resourced high school students with one-year internships that involve formal training and mentorship. On Thursday, Mallett and Gamble, who are brothers, spoke to the crowd about how the experience has affected them and better prepared them for life. Mallett shared that he plans to be the first person from his family to attend and graduate college. Gamble followed up by saying he’ll be the second. Dinner was provided by Lettuce Entertain You restaurants, SPLASH served as the event’s print media sponsor, and Athletico Physical Therapy was the matching sponsor of the “instagive program,” matching donations to Chicago Bulls Charities at the event up to $10,000. Chicago Bulls Charities also partnered with Chicago-based neckwear and men’s accessories retailer, The Tie Bar, on a special line of ties, pocket squares, and socks designed in collaboration with Bulls players. The Chicago Bulls Charities Collection debuted at the event and are now being sold at the in-arena team store, on The Tie Bar’s website, and at their location in Lincoln Park. A portion of proceeds from the collection will benefit Chicago Bulls Charities. Bulls coach Tom Thibodeau echoed Paxson’s comments when it comes to the collective efforts that surround him. The players, among the most visible members of the organization, are well known individuals with the ability to make a great impact. And as many of them acknowledge, support from the team and Chicago Bulls Charities is crucial when it comes to doing just that. “It’s always great,” said Taj Gibson. “I’ve been here for a number of years and the way the foundation is set up, it’s only getting better and easier to contribute. I’m happy to be a part of it. Perhaps it was Hall of Famer Scottie Pippen, who is currently a special advisor to the president and COO for the Bulls, who summed up the night as well as anyone. “It’s a great event, 26 years and strong as ever,” said Pippen. “It’s something that has been very beneficial to the city of Chicago. It’s something that I know the players look forward to and it’s a great opportunity to get out and mingle with some of our sponsors and fans. On a night like this it’s easy to see what this organization is really all about. All proceeds from “An Evening with the Chicago Bulls” will support Chicago Bulls Charities. Under the leadership of Nancy Reinsdorf, the charity’s president, and Leslie Forman, its vice president, Chicago Bulls Charities provides annual financial support to Chicagoland nonprofit organizations that share the Bulls’ commitment to youth education, youth health and wellness, and violence prevention. Chicago Bulls Charities and the entire Bulls basketball family work to address community concerns and find ways for the organization to make a positive impact on the lives of those in need. NBA’s Community Assist Award: Vote now for Gasol and Noah!